I sucked it up and survived those few hours on the green, but barely. It wasn’t pretty! My achievement of the day was making not one but TWO putts for my team and no I was not the first person to putt (the first question my husband asked!). When it’s all said and done though, I am not a golfer and I definitely don’t aspire to be one. I’ll stick to things I’m good at, like mini-golf (putting ONLY!) and baking! It’s safe to say my kitchen results will always be better than my golf game, and I think this French Apple Galette proves my point! I made this for our friend Mike’s French-themed birthday dinner and it was the perfect way to end our meal. The pastry came together easily in the food processor and was flaky and buttery, an ideal vehicle for the baked apples. This tart varies from others in that it is first filled with chopped apples which are then covered with the layered, sliced apples for greater aesthetic appeal. Despite not pre-baking or sautéing the apples, they softened nicely in the oven, the final result a medley of flavors and textures. 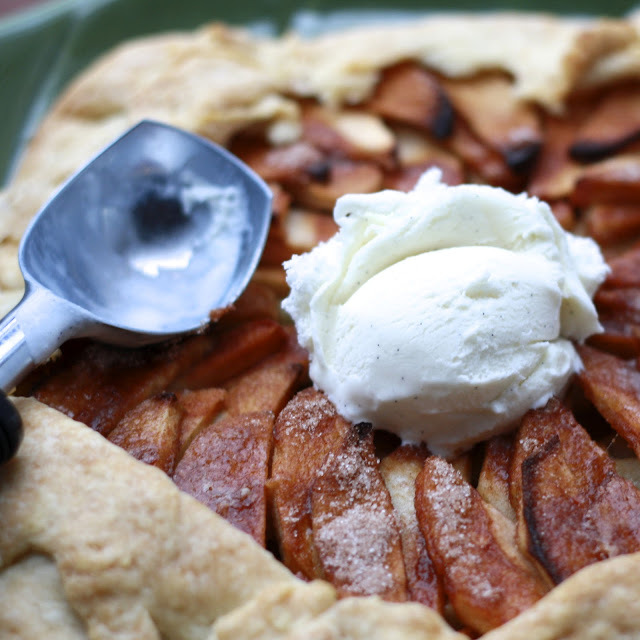 Served with scoops of vanilla ice cream, I can’t think of a better Fall dessert! The winner of Saturday's cookbook giveaway was Commenter #5, Barbara N, who said: "My favorite cookbook is a Betty Crocker cookbook that was my moms...with handwritten notes included" Barbara, please email me at natalie@thesweetslife.com so that I can arrange for your cookbook to be mailed to you! 1. In the bowl of a food processor, add the flour, sugar, salt, and butter. Process for 5 seconds. Add the ice water and processor until dough begins to come together (about 10 seconds). Transfer the pastry and wrap in a piece of plastic wrap. Refrigerate while you prepare the apples (can be refrigerated overnight). 2. Peel, halve, and slice the apples. Set aside the center slices and coarsely chop the end slices and any broken ones (you want about half of the slices to be chopped). Combine the sugar and cinnamon in a small bowl. 3. Preheat the oven to 400F. Roll out the pastry on a lightly floured surface until its approximately a 12 x 14 inch rectangle. Carefully transfer to a baking sheet lined with parchment. Spread the chopped apples over the pastry, leaving about a 1 inch rim all the way around. 4. Drizzle the honey over the chopped apples and decoratively arrange the apple slices on top of the chopped apples so that they are slightly overlapping. Sprinkle the cinnamon sugar mixture on top of the apples and dot with pieces of butter. Fold the pastry edges up and over the apples to create a 1-inch border. 5. 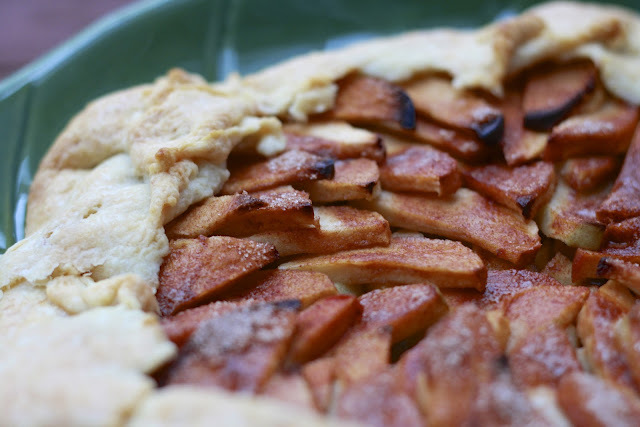 Bake for 50-60 minutes, until the pastry is lightly browned and crisp and apples are tender. Transfer the pan to a wire rack and allow the galette to cool. Serve warm or at room temperature with ice cream. 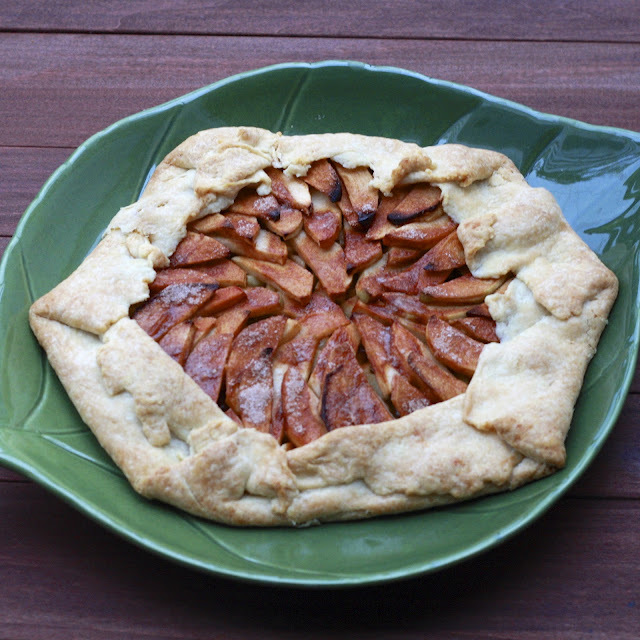 (Note-galette can be reheated in the oven for 15 minutes if you want to serve it warm).